New Delhi: As much as 85% of India’s industrial clusters are so polluted that environment minister Jairam Ramesh has asked for a halt on expansions in these areas. “Many of these areas have reached their limits and the situation in not under control as of now," Ramesh said on Thursday after releasing the findings of a survey on pollution levels in industrial clusters. The survey, conducted by the Indian Institute of Technology, Delhi (IIT-D) and the Central and state pollution control boards, found 75 of 88 industrial clusters to be extremely polluted. 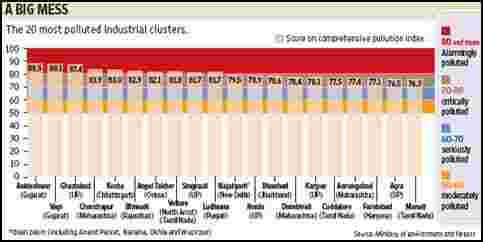 According to the study, titled Comprehensive Environmental Assessment of Industrial Clusters, 10 industrial clusters scored at least 80 out of 100 in a pollution index (alarmingly polluted); 33 scored between 70 and 80 (critically polluted); and another 32 scored between 60 and 70 (seriously polluted). “The high levels of pollution and its relation with public health is a serious concern", Ramesh said. “We have to look at that impact as public health has become a serious issue," he said. “I have asked the Public Health Foundation of India to link environmental pollution level to public health. Some state governments have written to me on this issue," he added. The Central Pollution Control Board will now work with the state units to prepare action plans for polluted industrial areas, with financial and organizational support from the environment ministry. “I shall approach the finance minister for a funding mechanism on a partnership basis for clean-up under these (action) plans," Ramesh said. The study also called for improved consistency in pollution monitoring data from various states, better selection of sampling locations, and data collection on the impact of pollution on humans. “Yes, these spots need to be cleaned up. The idea sits with the ‘polluter pays’ principle," said Leo Saldanha, coordinator, Environment Support Group, an activist group. “The government should penalize those who have criminally polluted these areas." Saldanha said such critically polluted areas need to be shut to protect water sources from contamination. “Epidemiological studies have to be done and those affected need to be compensated," he added.